With thick skin and even thicker skulls, there's nothing a Tyrannian loves move than jumping off of cliffs. They've even starting using parachutes! What, you've never been? Come on, it'll be great! As they say in Tyrannia, "ugga ugg va tyranu unga nug evavu grag!" That mean "what go up, must come down"! 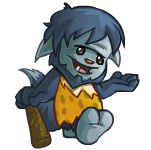 At the start of the game, you will be randomly assigned one of five characters to play as: a Kacheek, a Wocky, a Scorchio, a Meerca, or an Usul. While there's no difference in how each is controlled, they will always be in this same order from left to right, with certain positions slightly more advantageous in some of the game's levels; the Usul and Meerca, for example, will be positioned directly above the mud in some levels. The game consists of four levels, each of which contains five rounds. The first jumper to safely reach the ground will earn 1st place for the round, the second 2nd place, etc. To play, press the space bar on your keyboard to jump off the cliff you start on once the green text reading "Go!" appears; if you jump too early, it will be counted as a false start, and you will be penalized 200 points. While falling, you can use the left and right arrow keys to move and collect tokens or to position yourself for landing. If you bump into another jumper and are either level with or lower than them, you'll be able to push them upwards and yourself farther down; however, if you're above them even slightly, they may be able to push you upwards. When nearing the bottom of the level, press the space bar again to deploy your parachute to come in for a soft landing. Once your chute has been released, you will be unable to use the arrow keys, so only do it when you're sure the ground below you is solid. If you land in the mud rather than on the rocks at the bottom of the level, or if you open your chute too late and crash on the rocks, you will lose a life and be given another try at the current round. You will also lose a life if you take 5th place in a round, or if you place lower than an average of 3rd overall at the end of a level (in which case you will restart the current level from its first round). If you lose all three of your lives, it will be game over. Each level is also littered with tokens, which can be collected and spent on upgrades once the level has ended. Tokens found in levels will add 10 to your wallet (displayed in the bottom-left corner of the screen), but you will also receive tokens depending on how well you place in a round. Because of this, you should focus on your landing and getting 1st place each round rather than collecting tokens; by doing this, you will receive enough tokens to buy all the upgrades by the end of the third level. See the Scoring section below for more information. There are two types of upgrades available for 500 tokens, each of which can have its effect increased three times, totaling 3000 tokens to fully upgrade both of them. As tokens are used for nothing else in the game, you should purchase these upgrades as soon as you're able. It is recommended that you buy one of each after every level, to keep them balanced and to remain competitive with your opponents. In Ugga Drop, points are earned depending on how well you place in each round, with no points awarded for coming in 5th. If you attempt to jump off the cliff before the countdown has finished at the start of a round you will lose 200 points, and you won't receive any points for collecting tokens as you fall. The maximum score you can achieve is 40,000 points, by getting 1st place in all twenty rounds. Through careful manipulation of which place you take, it is technically possible to score more than 40,000 points; if you place lower than 3rd in a round you will lose a life and be forced to start the round over, but will retain any points earned in the failed round. By using two of your lives and getting 3rd and 4th place the correct number of times, you can achieve a score of 42,600 points. Any scores above 40,000 that you submit will be rejected, however, so there is no advantage to doing this. 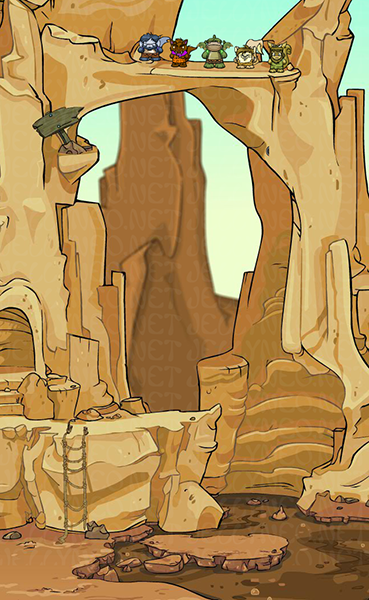 Rather than featuring different areas, in Ugga Drop you ascend a rocky spire, with each level taking place a little higher up. Because of this, you should be able to recognize when you're getting close to the ground, and when to open your parachute. Level 1Level 1 is set closest to the ground, and each round contains 8 tokens, 6 of which are visible from the starting position. Level 2In Level 2, each round contains 14 tokens, 4 of which are visible from the starting position. Level 3In Level 3, each round contains 18 tokens, 2 of which are visible from the starting position. Level 4Level 4 is the highest in the game, and each round contains 20 tokens, 1 of which is visible from the starting position. This page was last updated on February 13, 2019.